NAB Show, Las Vegas, April 12, 2016 – Advantech (TWSE: 2395.TW) today unveiled its new series of fully integrated video processing platforms that have been designed to boost performance of HEVC applications at the lowest power budget. 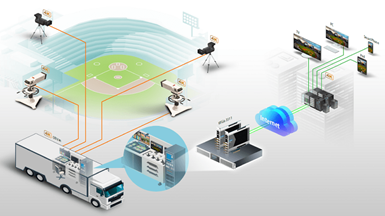 The new systems from Advantech streamline the development of more efficient video processing infrastructure solutions in 4K/UHD contribution, production, and distribution workflows. The VEGA-7000 Video Server is a highly configurable 1U platform designed to overcome IT-grade machine limitations for high-density encoding and transcoding applications, allowing it to support up to 4 independent channels of 4Kp60 acquisition with 10 bit HEVC encoding, and streaming via redundant 1GbE or 10GbE network interfaces in less than 350W power consumption.“The VEGA-7000 video server possesses the highest channel density in a 1U system supporting UltraHD video processing and is scalable to address various video applications ranging from smaller resolution in mobile video to high definition 4K and 8K in broadcasting,” said August Hsieh, Senior Manager of video server product lines.The VEGA-7000 offers four PCI Express slots in a short depth (20” / 500mm) chassis compared to only two slots in the more conventional deeper IT grade servers. It offers a wide choice of video and network I/O configurations, including 4K low-latency video-over-IP interfacing, and its highly reliable architecture includes redundant power supplies, redundant program storage, hot swappable fans, and four 2.5” HDD/SSD slots that can be configured as a RAID storage array. It is designed for OEM customization with replaceable bezels and a programmable LCD control panel. Moreover, the VEGA-7000 introduces Advantech Media Flow Software framework which is a user-space tool designed and supported by Advantech to simplify encoding and transcoding application development. The VEGA-6300 and VEGA-6301 Compact 4K HEVC Appliances are the first two members of Advantech’s new VEGA-6000 series that target power and space constrained scenarios such as outside broadcasting and remote contribution in live events coverage. Both units are 1U high, less than 270mm deep, and two can fit side by side in a standard 19” rack. “The debut of the VEGA-6000 series from Advantech represents a major breakthrough in our video product offerings as this is the first time that we provide a highly integrated, full-fledged all-in-one video processing solution in a tiny box.” said Ted Feng, Senior Manager of video appliance product lines.The VEGA-6300 supports 4K/UHD or FullHD video acquisition over built-in SDI-3G, SDI-12G or HDMI 2.0 interfaces, real-time H.264 and HEVC encoding, and video streaming over USB or Ethernet in less than 25W. Remotely managed via HTTP/CGI, the VEGA-6300 is a simple and ultra-low-power way to add 4K HEVC encoding and streaming capabilities to portable, lightweight solutions. The VEGA-6301 is a contribution-grade HEVC encoding appliance that also supports SMPTE 2022 and future 4K video-over-IP interfaces in addition to the more traditional SDI and HDMI interfaces. It features a more conventional in-chassis application development environment with a front panel LCD display and control for additional user interaction. The VEGA-6301 can perform real-time 4K HEVC 10-bit 4:2:2 encoding and streaming in less than 80W and can form part of a flexible and efficient IP-basedfield production, that significantly reduces cabling when compared to traditional SDI-based deployments. The new VEGA-7000 and VEGA-6000 series are an important milestone in Advantech video product offerings as customers can now scale video processing applications throughput from embedded to cloud across a broad range of versatile video platforms from Advantech. The systems offer higher processing densities in a significantly reduced power and space envelope, allowing OEMs to not only pass on the benefits of improved product costs to customers, but to tap into the excess processing power to create new and exciting video processing applications.With these new series of application-ready videoplatforms, Advantech will accelerate next-generation video infrastructure product rollouts to serve increasing market demands. Meanwhile, the video software framework integrated with these platforms also facilitates the video workflow, configuration, interfacing, distribution and scheduling for deploying video services while minimizing customer roll-out efforts. Advantech’s new VEGA-6000 Video Appliances and VEGA-7000 Video Server functionality will be demonstrated live at NAB 2016 booth # SU10513. For more information, please contact video.solutions@advantech.com or visit www.video-acceleration.com.